There’s something special about a series that you can read time and time again, and always come away with a new interpretation and sense of wonder. One thing that hasn’t changed (despite how many times I’ve read this series) is my complete and utter love for the world of Alegaesia. We follow Eragon, once a simple farm boy, now a Dragon Rider and Alegaesia’s only hope for freedom, as he fights for his country and against the evil emperor, Galbatorix. Through Eragon’s detour into Farthen Dur, we learn how deep his morals run and his true character. I appreciate how Paolini is able to keep Eragon human and deeply flawed despite his almost infinite powers. Through Sapphira’s scenes, we finally know what it is like to be a dragon. Complete with magic, mystery and awe-inspiring moments. Through the Trial of Long Knives, we learn the strength and tenacity of Nasuada (leader of the Varden). She became an absolute pinnacle of grace, poise and ruthlessness in one, short scene. And through the election of the next Dwarven king, we truly learn how deeply convoluted and boring Dwarf politics can be (I’m not saying it wasn’t important, but good lord that was a long scene). 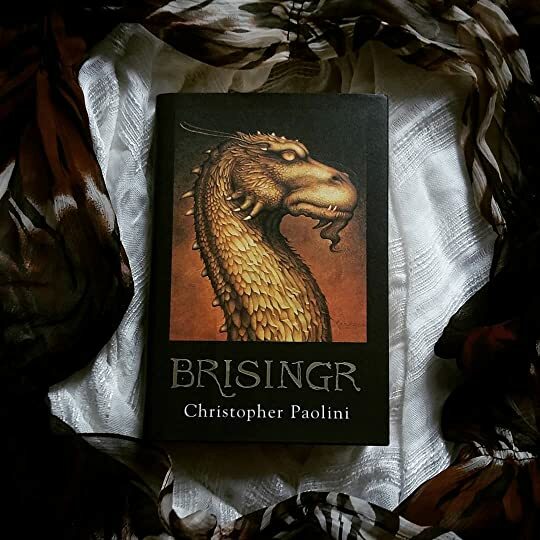 Christopher Paolini does such an amazing job fleshing out the world of Alegaesia. I wholly regret that this world is one of fiction. I loved the return of Angela and her werecat – every scene the two of them were in just absolutely shone. I adored how much Roran has grown and changed over the past few books. Katrina has stepped up to the plate and has so much more personality now – it’s wonderful! The only thing that I wish would be differed would be the romance. I really wanted to see the romance between Eragon and Arya develop a bit more. I feel like there is so much potential but we only see a small sliver of that. Read by Gerard Doyle and I love the consistency of the narration. These books are all over 20 hours, so I really commend the narrator. Also, love the accent that Murtagh (Eragon’s brother) has… BUT the dragon accents are just miserable. Picture Yoda with a head cold, gargling nails.